During the thirteen-day sessions you'll have eight full days of painting, drawing, or sculpting instruction and demonstration, a day trip with your group to visit regional sights and traditions, and two free days to relax or further explore the local area. Eight-day sessions will focus on six days of instruction. Come plein air paint with Heather Sink in the Tuscan landscape! We will paint in breathtaking locations to inspire your creative work. Paint the countryside and quaint villages, including Seravezza (where Michelangelo once lived), the architecture, the people, flower pots on steps, and everyday scenes found in the non-tourist locations. Everywhere you look there is a painting waiting to be painted! Heather has a passion for teaching and travel. She has many years of teaching art to students of all ages, and she lived in Italy many years ago. There will be a focus on individual artistic growth, whether you are a beginner or an experienced artist. Heather’s nurturing and informative encouragement will make your experience a growing and positive step in your creative journey. Composition, value, and color will be addressed in lectures. Individual instruction, demonstrations and critiques are other important elements in this workshop. Students may use acrylic or oil paints. Bring your own paints and gear. Odorless mineral spirits will be provided for oil painters. Excellent art instruction plus Italian culture plus fantastic food equals a fantastic life experience not to be missed! Danni and Mike’s workshops provide students with a wealth of painting and sculpture opportunities. Danni’s sessions will feature painting and sculpting directly from the model, using both grisaille and color studies. Mike will focus on landscape painting in the village and on the mountainside (at Montorno). Students may work in oils, acrylics, watercolors or pastels, and will receive daily critiques. Contact Danni and Mike. Visit Danni's website. Painting with direct, bold and beautiful brush stokes like John Singer Sargent. Capturing the effects of sunlight using Impressionist color theory. Leonardo DaVinci’s lessons on atmospheric perspective. Maximizing transparent and opaque pigments to create depth and drama. Gavin’s workshop will focus on his great artistic loves - historical landscape and cityscape painting and portrait and figure painting. We’ll paint and draw in the ancient village of Seravezza, where Michelangelo once lived and worked, as well as with models in the studio. We can set up still lives and get lost in the details of barn doors or sweeping vistas. Gavin will give group lessons, demos and individual feedback, and students will have plenty of time to work at their own pace, spend as much (or as little) time as they’d like working with Gavin, and take breaks to read, explore and possibly nap. During the thirteen-day sessions you’ll have eight full days of painting or drawing instruction and demonstration, a day trip to visit a local site like Lucca or Pietrasanta, and two free days to relax or explore. 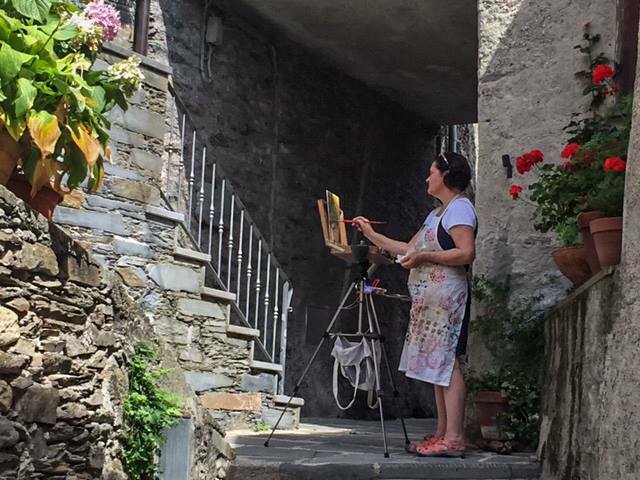 Painting plein air at Montorno, (just North of Lucca) and the areas surrounding provides a unique opportunity to experience the beauty Tuscany has to offer. Nicole Kennedy, known for her award winning paintings of Italy, will be in her element at Montorno and the surrounding areas with students to explore the areas visual diversity, from the Montorno villa with breathtaking mountain views, to charming villages, a day at a colorful coastal port with boats and even the option of painting a model in the environment. Nicole’s focus will be instructing students en plein air; capturing light, composition, simplification, values, color, drawing, tips for painting water, and other essentials for successful results. Nicole Kennedy is well known for her energetic, enthusiastic teaching method. Students will receive individual attention and be encouraged to discover their creative voice. While class focuses on oil or acrylic on canvas, watercolor and pastel artists are welcome. Nicole will demo every day emphasizing problem solving methods common in painting from life. Students will also learn how to take great photographs for studio painting, even with an iPhone! Group will also take an excursion exploring the culture and scenery of the region. 13 days, 12 nights with 8 days of painting, a day trip to local sites, and 2 free days to explore on your own. Contact Judy Morse, Montorno Coordinator, for more information.